Musician First Class Robert Kurth was looking to "sing a different tune" after he joined the U.S. Navy. While he was in boot camp in 2014, a colleague told him about military singing groups, including the Navy Band Sea Chanters, the United States Navy's official chorus. 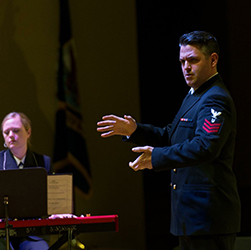 The ensemble performs a variety of music ranging from traditional choral music, including sea chanteys and patriotic fare, to opera, Broadway and contemporary music, performing throughout the United States. At home in Washington, D.C., they perform for the president, vice president and numerous congressional, military and foreign dignitaries. The group from the Navy School of Music formed in 1956 to sing chanteys and patriotic songs for the State of the Nation dinner. Adm. Arleigh Burke, then chief of naval operations, transferred the group to the Navy Band, named them the Sea Chanters and tasked this all-male chorus with performing the songs of the sea. In 1980, the group added women to their ranks and expanded their repertoire to include everything from Brahms to Broadway. Kurth is contractually committed to four years of service, but for now, he loves being a part of such a special group. He said he never gets tired of one type of music because the Sea Chanters sing such a broad range of songs. "This is the ideal job for my skillset," he said. Earning a Master of Music degree from Duquesne in 2008, Kurth has served as assistant director of choral activities at the University, performed small roles and chorus parts for the Pittsburgh Opera, and taught general music and chorus in Ohio County Schools in Wheeling, W.Va.
"One of the benefits of Duquesne is that I had the opportunity to get involved in a number of things," he said. "There is also a lot of character there, a Holy Spirit background. I appreciate the character that is built into everything they do."